Howdy! 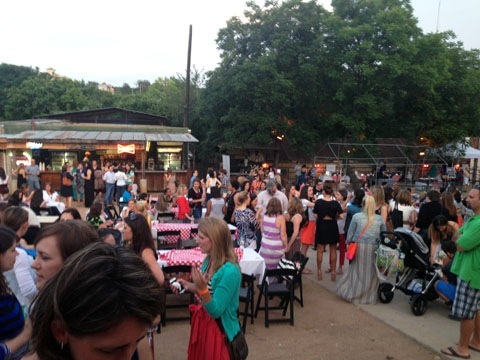 I just returned from BlogHer Food 2013 in Austin, Texas, and can now definitely say that Austin is one of my favorite places in all the world. I was attending the BlogHer Food conference partly for work and partly for play. 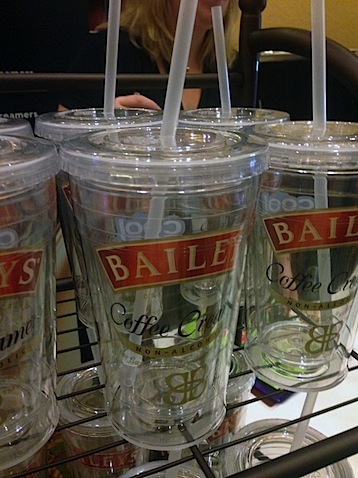 One of my clients was attending as a sponsor (Baileys Coffee Creamers), so I went to help with the booth and do a little networking and have a little fun. I would say all of the above were accomplished! I didn’t take photos like I usually do at conferences, but thought I would share what I did have from the weekend. Because I was attending as a brand instead of as a blogger, I didn’t get to take part in a lot of the normal blogger excitement, like private events and parties. And while I got to see plenty of my blogger friends, I didn’t get to spend a whole lot of quality time with them. It’s always a little weird to be stuck in between two worlds; that of marketing professional and blogger. But kind of cool, too. And I still got to see plenty. 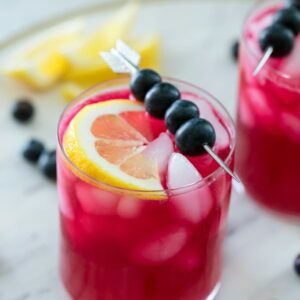 I attended a few sessions and can definitely say that I learned a ton from “Salvage that Bad Photo” with one of my fave bloggers, Irvin from Eat the Love, along with The Tomato Tart. 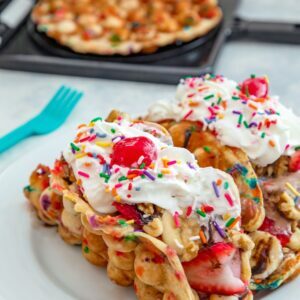 Since I work in social media, I always find the social media panels at blogging conferences a little lacking, but have to say that BlogHer Food had some of the best I’ve seen yet. Of course, the Brand/Blogger Relations panel also brought on a very interesting conversation and I loved meeting Busy Dad Blog, who’s in the same position as me with working in PR and having a blog. 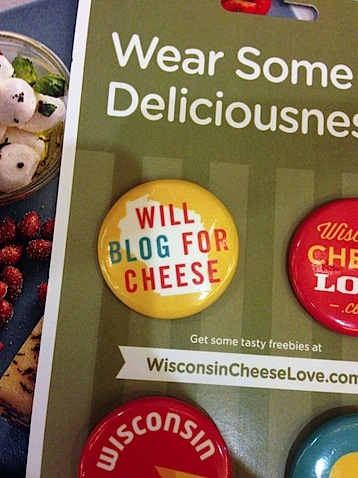 These buttons from Wisconsin Cheese. OK, they also had some really awesome samples, like chai spiced granola with gouda in it. 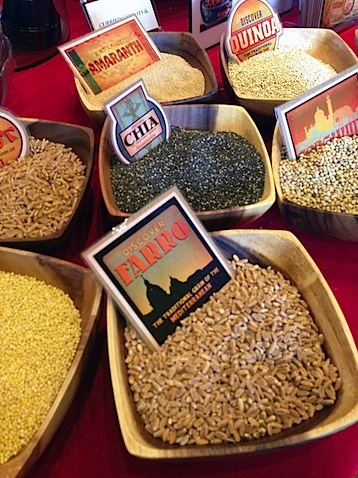 Bob’s Red Mill is always one of my favorites and it was fun to see their huge variety of grains and new packaging. 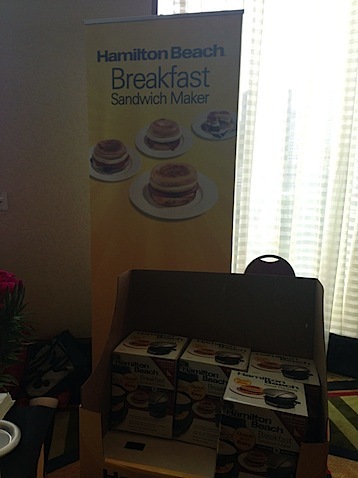 Hamilton Beach had a Breakfast Sandwich Maker that was a HUGE hit. This little appliance makes a breakfast sandwich just as easy as can be. 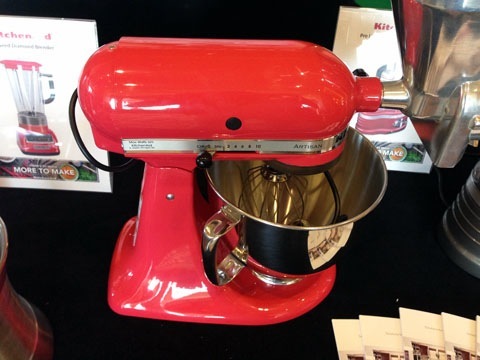 KitchenAid was showing off their brand new mixer color, Watermelon. I’m not sure that this photo does the color justice, but it’s stunning! 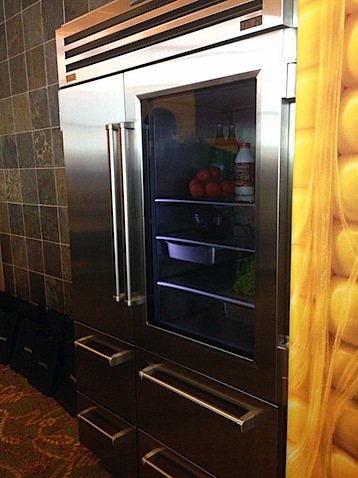 I almost cried while checking out the Sub-Zero Pro 48 refrigerator and freezer. Legit tears. I mean, look at this baby. Some day I WILL own this in my home. I have to. And everything will be so perfectly organized and in its proper place and my food will always be fresh and delicious. And I will die happy. I can dream, right? 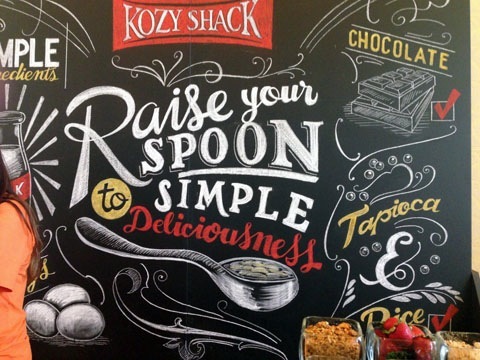 Kozy Shack had a beautiful chalkboard mural created for BlogHer and was giving out the most adorable bowls. I have a “thing” where I don’t go around picking up meaningless swag at blogging conferences anymore as I have too much random stuff I’ve picked up over the years that is totally useless. So, I only bring home what I’ll actually use. This bowl I will use! In addition to spending time at the conference (I have to say that the Hilton was quite lovely! ), I also had the opportunity to get out and take advantage of lots that Austin has to offer! This place just felt like Texas. 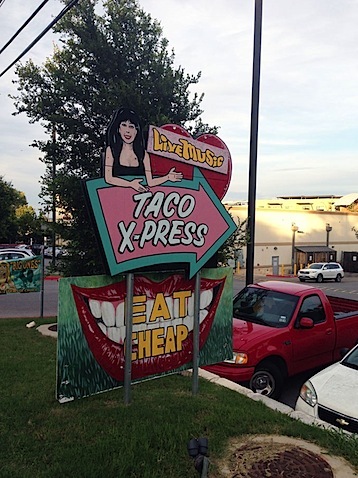 When I told my Austin-living cousins where we were going on this progressive dinner, they said it sounded like a real Austin insider must have planned the excursion and these places were really little hidden gems and not at all tourist traps. Thanks to Dad Labs for taking us to these spots! 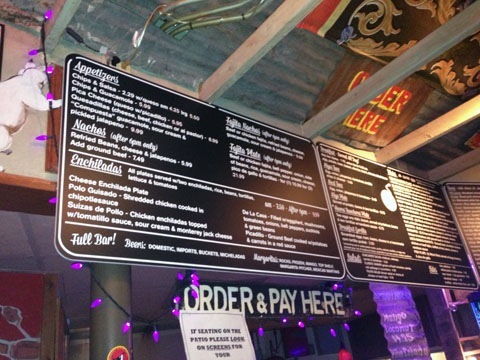 Taco Xpress had a really cool vibe and a fantastic menu. 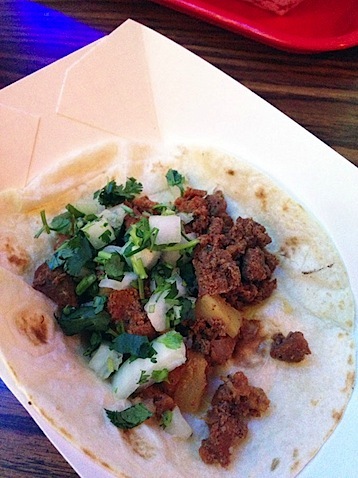 Our tour guy recommended we try a few things, including the tacos al pastor and they absolutely did not disappoint. In fact, they’re Guy Fieri’s favorite item. I may not be the biggest Guy Fieri fan, but I can see why he loves these! I could have eaten about 12 of them. Why can’t we have tacos like this here in Boston? Whyyy? 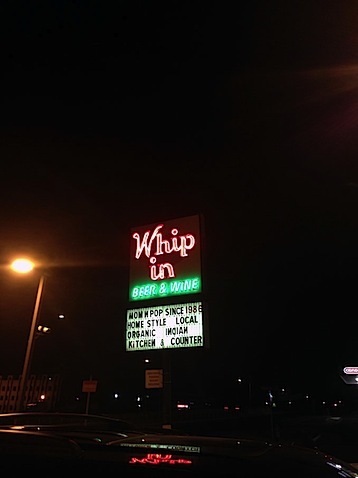 Our next stop was a spot called Whip In, which just happens to be a former convenience store turned bar. Crazy, right? 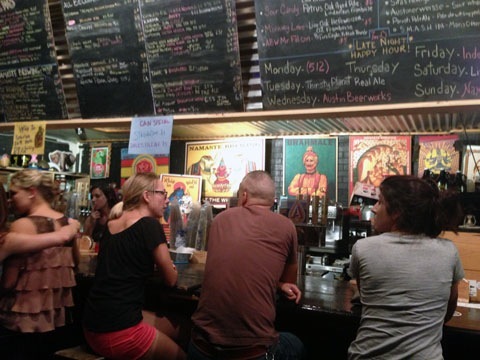 It also had the BEST atmosphere, with a huge menu of craft beers and Indian fusion food. There was a band inside and outside and this place just happened to house the most hipsters I’ve ever seen in my life. I enjoyed a local beer (a Bootlegger Brown Ale) and some snacks and we just sat outside and enjoyed the atmosphere. We ended our progressive tour here as we were convinced to go in a bit of a different direction. I’m not going to lie, I was pretty disappointed my friends weren’t up for going to Gordoughs, the doughnut shop. You might know how I am about doughnuts… And I was really looking forward to trying this, especially considering it was National Doughnut Day. However, we had been told my multiple people that we absolutely had to go to the Continental Club, so we headed there instead. My disappointment was quickly quelled, when I realized how incredible this place was. It was a real deal Texas bar and not the “club,” I was expecting. Texan bands were playing and people were two-stepping. It was seriously awesome. 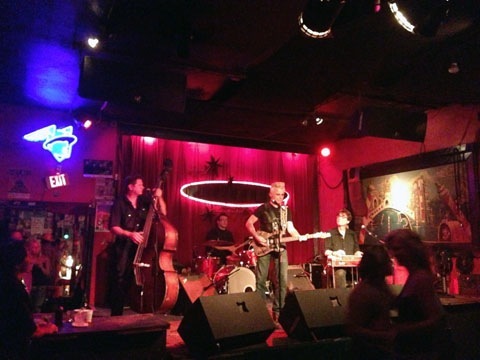 We absolutely loved seeing Dale Watson and his Lonestars take the stage and had a blast at the venue. We also got to meet up with my cousins, Cherylann and Tom, one evening. They’ve lived in Austin for about 20 years now and are the reason I’ve visited in the past. They took us to a little area called Rainey Street, which is pretty much my new favorite place on Earth. 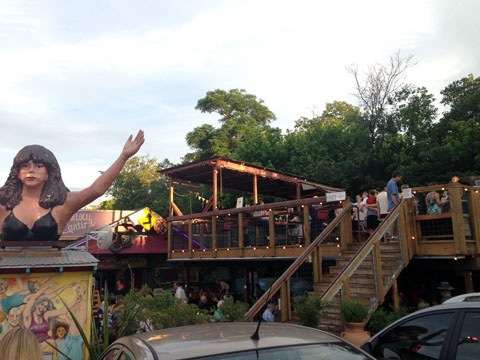 Rainey Street is a little residential neighborhood that has been turned into a nightlife destination. Many of the old historic homes have been turned into bars and restaurants and though it still has a neighborhood feel (I seriously thought we must have taken a wrong turn when we first arrived), there is a ton to do. 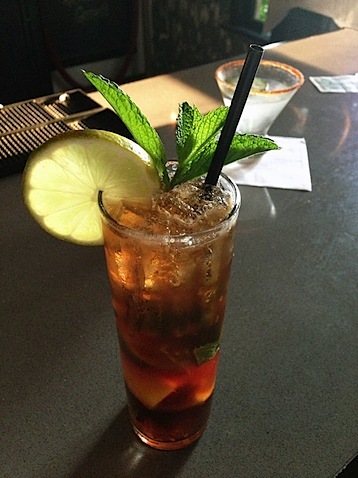 We hung out at a bar called Lucille, where I had the most fabulous Lucille Special Tea. 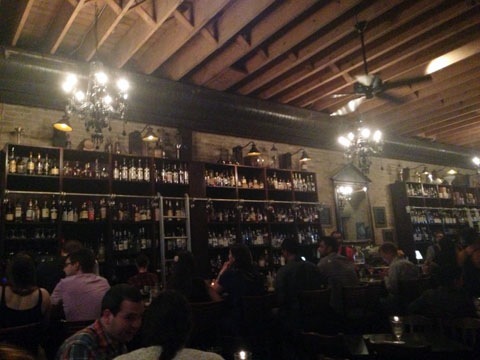 We also went to Black Heart, a very cool whiskey bar. Rainey Street, I will most certainly be back for you. 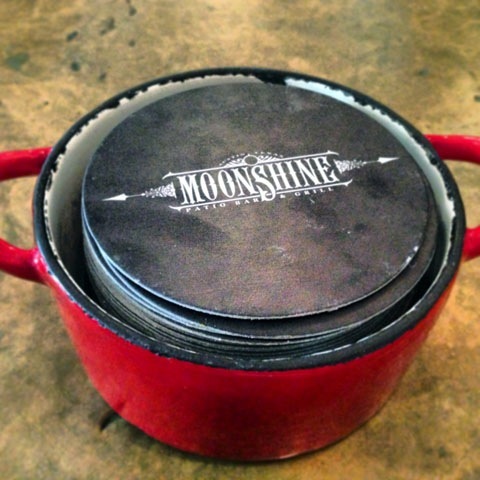 One afternoon, we snuck in a lunch at Moonshine, which we heard really good things about. 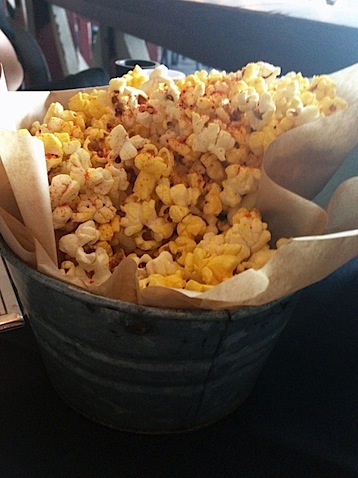 Any restaurant that serves popcorn before the meal is alright with me! 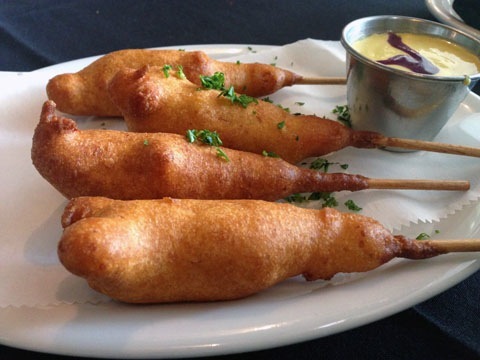 Shrimp corn-dogs don’t hurt either. 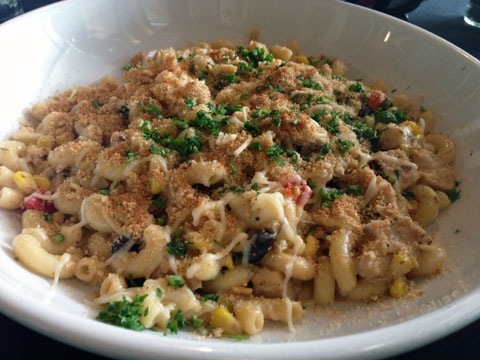 Nor does green chili mac and cheese. I should have been on food overload by now, but I was not. I was mostly just feeling joyful. Can you blame me? 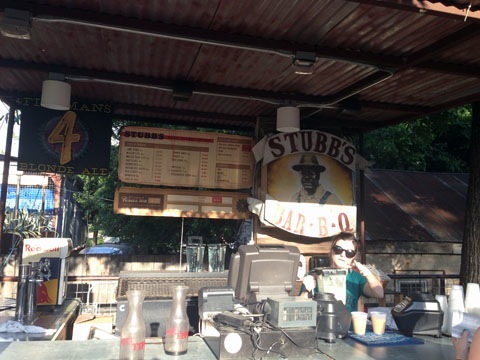 The BlogHer Food closing party was at Stubb’s and I was super excited of the chance to go to this BBQ institution. They had such a great outdoor area for a party. Plenty of room to pack all there bloggers into! 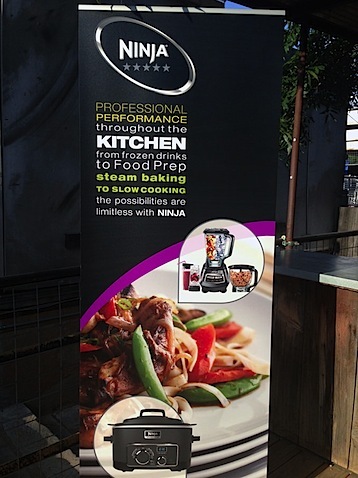 One of my all-time favorite brands, Ninja, was there whipping up cocktails in their blenders (I have a review coming up soon of Ninja’s brand new fryer!). 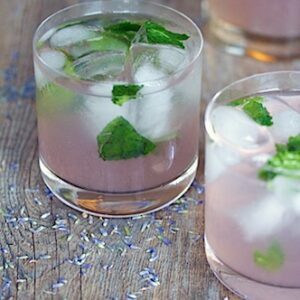 Such a great idea and the blended drinks were perfect to enjoy during the warm evening. We also got to try Stubb’s authentic BBQ. Again, food overload? Nope. 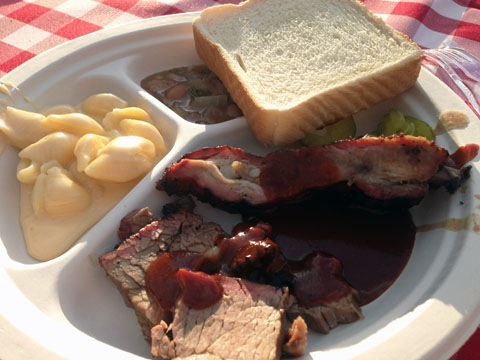 Beef brisket, ribs, mac and cheese, and more… I never want it to stop. 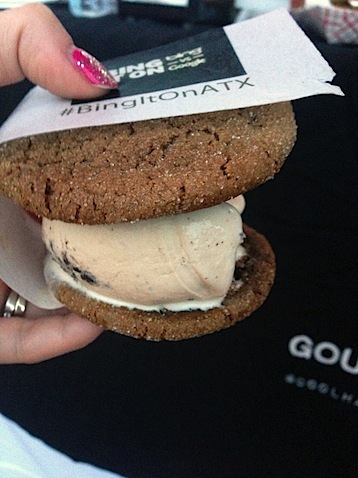 All topped off with cookie ice cream sandwiches from Coolhaus. After the closing party, we also got a chance to check out Peche, an absinthe bar. It had such a cool vibe and while we just ordered drinks, the menu looked wonderful, too. I had a Mexican Martini at some point during the weekend, too. Which I didn’t even realize was a thing. But it is. And they’re everywhere. The one I had at Iron Cactus actually came with olives. Love! Our last morning in Austin, we knew we needed some good old fashioned breakfast tacos. We headed to Trudy’s and I made it happen. This right here is true happiness. We also stopped by Whole Foods, which I wrote about the last time I visited Austin. There aren’t really any words except, if you’re visiting Austin, this is a MUST-SEE. Don’t let anyone tell you grocery stores shouldn’t be visited on vacation. This Whole Foods is not a grocery store; it’s a heaven. Before we left the city, we got to spend a little more tim with Cherylann and her kids. 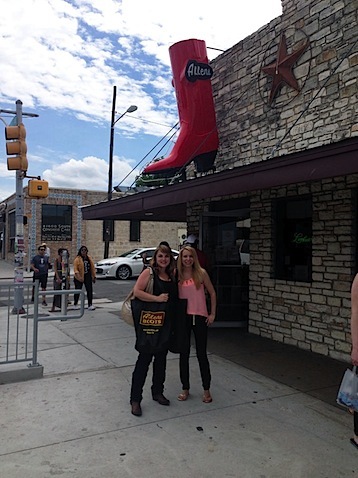 They took me and my co-worker to Allen’s Boots, where we both proceeded to purchase cowboy boots. You have no idea how excited I am to own real authentic cowboy boots and I’ll probably never take them off. We also got burgers at Hopdoddy. I was on serious food overload at this point and was just craving vegetables like no other (OK, so maybe I was final on food overload). So, I decided to go with the black bean and corn burger, which also happened to have avocado, arugula, cilantro pesto, goat cheese, and chipotle mayo. 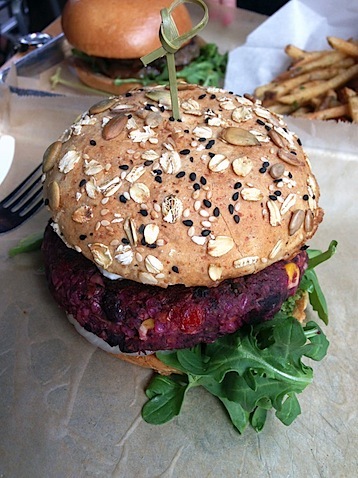 It was the best black bean burger I’ve ever had in my LIFE. Why doesn’t Hopdoddy exist in Boston?? Austin is just one of those places that feels like home. It’s also the one place that Chris would move to in a heartbeat if I gave the go-ahead. I’m thrilled that BlogHer Food was there this year and love that I have cousins there, which gives me the most fantastic excuse to visit. I’m sure I will be back very soon! Thanks for a great time, BlogHer Food. It was awesome to attend as a brand, but I’m thinking that it might be nice to attend as a blogger next year and experience all that the event has to offer from that side of things. One thing is for certain… It’s going to be TOUGH for BlogHer to match the location. 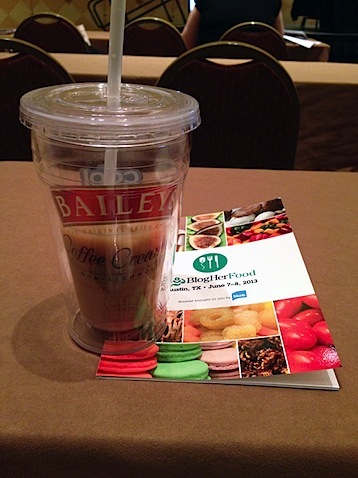 Could a food conference be held anywhere that’s better than Austin, Texas? We’ll see! Have you visited Austin before? 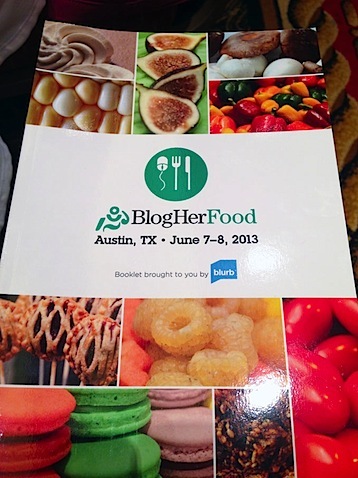 20 Responses to "BlogHer Food 2013 in Austin, Texas"
Wow! Looks like such a fun time! I’m so happy to hear you had a great time! Austin is a fantastic city – one of my favorites too. If it didn’t get so hot there I’d really consider making the move someday. Maybe I still will – once the snow up here gets to be too much. 🙂 It looks like a great conference and all the food…I’m hungry just looking at these photos! But, like you, that Kitchen Aid mixer and the Sub Zero fridge have my heart. Ohh beautiful, beautiful appliances. Be still my beating heart. So jealous of this trip! Especially all the food and the fact that you went to the Continental Club. I would die if I had that fridge too!! How fun that you got to go for work and play! Looks like you had some really good eats! Your recap is awesome! I’ve been reading so many lately and they all have the same pictures, so I really enjoyed yours. I must make a trip to Austin soon! I’m also in love with that breakfast sandwich maker, lol! ………..obviously been there many times these last 20 years, but have never experienced a fraction of the itinerary you had in such a short amount of time ……….jealous…………but so glad you had fun!!! How fun! I’ve never been to Austin, but it’s definitely on my list of places I must go to! 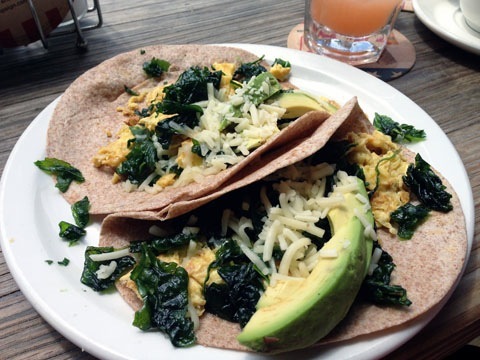 omg, i totally want breakfast tacos and that black bean burger!! so hungry now 😉 never been to austin, but i want to! 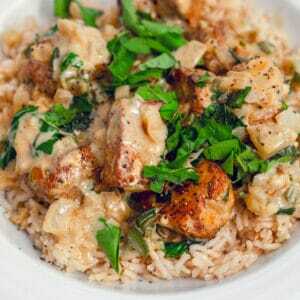 also need to get to a blog her food conference! how cool! So glad ya’ll got to go! I love Austin- its so close to Houston we go all the time! If you get a chance please come by and enter my giveaway! I really want to help get this company as many likes on facebook as possible! This looks like such a blast! 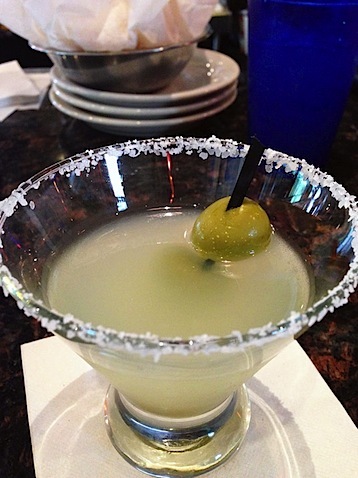 I’ve had the Mexican Martinis at Trudy’s and they are….dangerous! It’s my dream to visit Austin or really anywhere in Texas. I need boots!!! 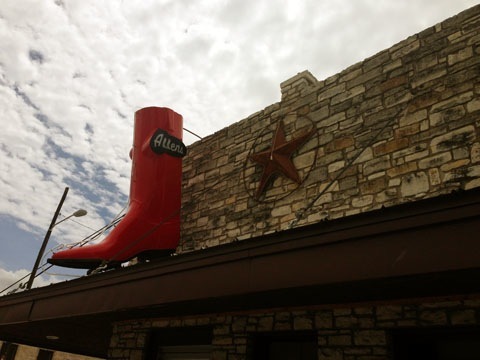 It looks like we all need another trip to Austin…Your Post was so beautiful and enticing … can’t wait to see your boots! What a fun wrap up – I’m longing to get to Austin someday in the near future. Hey, we need a close up photo of your new cowboy boots! It looks like you fit so much in and had such a great time. That refrigerator looks incredible! It would bring me to tears too! Austin is on my list! And that refrigerator…yes please. What a delicious trip! We really want to visit Austin! Happy to see Coolhaus there – did you meet my friend Nastassia?!? I have yet to go to BlogHer but would love to one day…I love Austin – have been there for SXSW and to speak at the college but never just for fun! Sub Zero – Wolf have a manufacturing plant here in Phoenix. They also have a huge multi kitchen showroom in Scottsdale that includes a competition stadium complete with overhead cameras. I’ve attended a wine tasting and a chef competition there and the place is just amazing. surf and give it a shot. Are you looking to sign up?